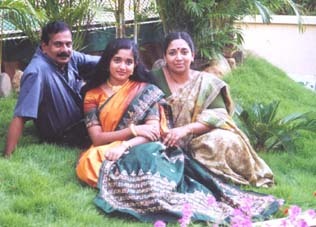 Kavya Madhavan was born in the village of Nileshwaram in Kannur district, Kerala. Her father P. Madhavan is an accountant and mother Shyamala a house wife. She has one brother Mithun, who is doing his post graduation in fashion designing in Australia. She started to learn dance while in High School. She was a Kalathilakam in a Sub District Schools Youth Festival. The title is bestowed on artists who prove their skills in most artistic fields. "Kavya entered the industry as a child artist in the film Pookkalam Varavayi (1991) in the role of a school girl. She came to public attention when she played the childhood part of the heroine character in Kamal's Azhakiya Ravanan (1996). She has since acted in over 50 films in Malayalam and a few in Tamil. She is noted for having retained her typical malayali look. Now kavya is known as Malayalam's own heroine. She embodies the typical Malayali woman look.Her pairing with Dileep was a sure success and they were considered as the most successful pair. Natan kalayude charithra bhoomiyaya kannur, malayala cinemakku sammanicha Kavya Madhavan..